England won by 3 wickets. We'll be back on Sunday for the decider - the game starts at 10:30 BST, TMS will be there from 10:15 and we'll see you bright and breezy from about 10:00 for the toss. Bye for now. Max Baggins-Craig: Great win for England, man of match was a tough one, Morgan's performed really well, but Maxwell outstanding by far. Julian, London pedantry: Re: Matt Swift - sorry should be 5 out of 5 as Cardiff 51 -29N is south of Watford 51-39N. More from England assistant coach Paul Farbrace on Sky: "Eoin Morgan plays in a way which allows others to play, he backs up the talks we have about playing with freedom, the way he skips down and puts the ball on the roof of the stand others think they can do that. "In the last two games, certainly with the bat we have been a lot more aggressive, and people have gone in and played how they want to play. "The basics of the game don't really change but it's nice to see aggressive partnerships. We've got series coming up where we can build our resources. Whatever happens on Sunday it has been an incredible summer." Jay: I want a three-match Test series and a three-match ODI series between a Cook-led & a Morgan-led England side. Would be awesome. England assistant coach Paul Farbrace on Sky Sports: "Exciting, wasn't it? There was quite a long period where we thought we were getting them. It was a very enjoyable run chase. We're learning all the time, Trevor [Bayliss] has spoken to the team saying 'great win, but still a long way to go'. "There's a lot of learning that needs to be done and the team know that and how they can improve all the time." "Teams haven't handled the pressure of chasing 300 very well until today. International teams should be used to playing under lights all around the world. "Agar in for Sunday, win the toss, win the game. Starc comes back." "In international cricket, you get players who hit 360 degrees around the ground and that's exactly when Matthew Wade did. With situations like that, you want to be hitting your yorkers, but having five fielders out does make that a little easier, but you need your instincts to tell you when he's going to hit you to fine leg. England have an opportunity now to win a series against the world champions." England all-rounder David Willey on TMS: "It was great to get a decent start for the lads, take the new ball and make early inroads. I'm not express pace, I do rely on swinging the ball, it was a bit overcast and I was able to swing it. We got off to a decent start but let them score a few too many in the last five, though a great knock from Morgs got us close and everyone batted around him. "Fortunately, there wasn't much left to do when I batted - the important thing was not to give my wicket away. After two losses, to level the series is a great set-up for Sunday, it should be exciting." More from England captain Eoin Morgan: "Going back to Old Trafford and knowing we have a game there under our belts already in this series can be significant." So, team selection for Sunday? As Marcus North suggests, I'd have thought Agar would have a case for selection for Australia after his omission today, while Sam Billings and Reece Topley will be hoping for a kind word from the England selectors after carrying the drinks for this series so far. But as it's a series decider, do you just stick with a winning team? England captain and man of the match Eoin Morgan: "Hugely significant. At the halfway stage we were confident we could chase it down the guys were pretty optimistic so to come out and have contributions by the majority of our team was a great chase. "David Willey took advantage of the conditions, we've said we need 15 or 20 guys, not be relying on just 11, so him producing a performance like that was outstanding." More from Steve Smith: "I guess we have to play the spinners a lot better than we have so far. You've got to be up for it, it's a final and we want to win every series we play." "Australia picked Marcus Stoinis today and batted him at eight - he's not going to get too many more runs there than Ashton Agar, who bowled so well at Old Trafford." "Australia might have been a different unit with Mitchell Starc playing today. But it's understandable that he was rested as he's had a very busy summer." Looks like Eoin Morgan is man of the match for his 92. Bit harsh on Glenn Maxwell, who scored seven runs fewer but took two out-of-this-world catches. JoElle: What a great game that was irrespective of who won. Well worth the early morning wake up call in Oregon. Matt Swift: They don't like it north of Watford do they? 6 out of 6. Dan Gee: Love this England team. Win or lose they play hard. Far cry from the World Cup. Just never pick Woakes again and we're good. Australia skipper Steve Smith on Sky Sports: "Very disappointing, I thought 30-3 was tough to come back from but our middle order played well, Bailey and Maxwell's was a magnificent partnership, no-one has got a hundred in the series so that would have been nice but 300 was around par. "But our bowling didn't get the ball in the right place often enough, the first and last ball went for four too many times." Naveed Afzal: The most competitive and entertaining game was in my biased opinion played at the real home of cricket in Yorkshire. Bryony Lever: Yes! So Willey did score the winning runs. Talk about making it home it style. Bring on Sunday! Steve Kenyon: I think it's time that we just admit that England are a very, very good cricket team. England captain Eoin Morgan on TMS: "Having Australia 30-3 at the start was outstanding, I was a bit disappointed with the next 20 overs as we put Glenn Maxwell down a couple of times. I'd have liked to be chasing 260 but I'd have taken 300 before a ball was bowled. We managed to stay on top of the run rate and there were contributions from everybody, that's always important for team confidence." (On the Maxwell/Plunkett catch) "To be honest, I need clarity on the rules. I thought they'd changed." "On the Maxwell/Plunkett catch - my understanding was that he couldn't jump from outside the playing area to take the final catch - I thought he had to land first." England wicketkeeper Jos Buttler: Great win! Congrats to all the lads. Awesome to watch. Australia captain Steve Smith on TMS: "We'd have probably liked to have had a few more wickets in the shed at the end for a late onslaught, but 300 was probably a par score. There are always lessons to be learned, we've got to lift our heads up and be up for Sunday." "If you look at the really good teams in world cricket they bat to 10. When Joe Root comes back Taylor will have to move to four. England are trying to develop a batting line-up that has options in all conditions. There is work to do in the bowling but with Willey and Reece Topley and Mark Footitt, I think the left-armers are really important." "That final six from David Willey meant it was 14 sixes in the match - which is a record for an ODI here at Headingley." "This is a really good performance from England. I felt Old Trafford was a sway of the toss but they've done it the hard way here, batting when it was getting slower and lower. 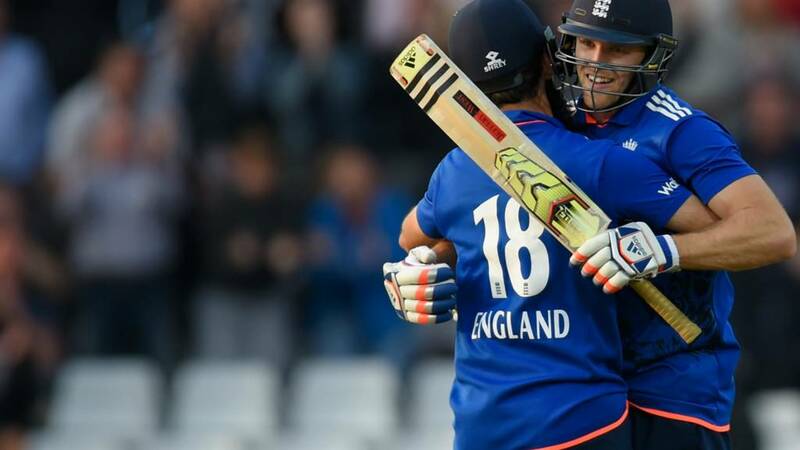 There was that momentum shift at the end of the Australia innings with Wade and Hastings, but Morgan the England captain has looked back to the top of his game and it's really good to see Moeen and Willey taking England to victory - that's exciting. "England have got the momentum and have found a way of playing. Once you get two or three batsmen playing nicely in a series where the matches are close together you can start posting some nice scores." James Gulleford: Well done to whoever it was who said earlier that Willey would hit the winning runs! Credit where credit is due, it was "Mystic" Michael Tiley in the 31st over - a bold prediction considering Morgan was still in. Stay with us for the presentation. Man of the match? Glenn Maxwell deserves it for those two "worldie" catches alone, never mind his 85 from 64 balls, but there should be honourable mentions for Eoin Morgan, Pat Cummins and David Willey, who all played major parts in an enthralling game. Prime Minister David Cameron, who's back sitting with Dickie Bird on the Yorkshire balcony, joins in the applause as England walk off, job done. The frowning Steve Smith leads the Aussies off, knowing his side has squandered a 2-0 lead in the series. "They're all hugging each other in the stands - what a response from the England side, the way in particular David Willey has come back into the side." Willey finishes the game in style - hoisting a six over long-on to wrap up a three-wicket win. John Hastings to return - it was him or Marsh, and "The Duke" gets the nod. Moeen heaves a single to deep mid-wicket. Two to win from 11 balls. Mickey Wallis: Even if England win, Glenn Maxwell is man of the match. not even in question. Alex Findlay: Incredible catch from Maxwell, how does your brain work that fast to do all of that?! Willey deals with a yorker. Dot. Three runs from 12 balls to square the series at 2-2. Moeen chips a single through mid-wicket. Three needed from 13. "I think the toss will be quite handy on Sunday. Runs on the board at Old Trafford." Swing and a miss from Moeen, who then hits the fourth ball straight to mid-off. Four from 14. Liam Sayers: Glenn Maxwell had taken two of the best catches I've ever seen in the space of about 10 overs. Willey smacks Pattinson to the cover sweeper, but a ricochet hits the stumps, a wild throw goes over the bowler's head and England benefit from an overthrow. Willey knocks a single - four needed from 16 balls. James Pattinson to bowl the antepenultimate over. Has been expensive so far. Great placement from Moeen, sweeping a four to the unguarded long leg boundary. Two more singles mean it's seven needed off 18 balls. And Maxwell finishes with 1-54 from his 10. Four overs to share around his remaining bowlers - and Steve Smith turns to Glenn Maxwell, bowling off-spin round the wicket to the two left-handers. Willey adds a single - 13 from 22. Moeen lofts Cummins over the infield, it's high but safe as they run three. Willey on strike for the first time. Willey stands tall, and is off the mark with a single to mid-off. England will need 14 off 24 balls, but Cummins has bowled his allocation - taking his cap with figures of 4-48 from his 10 overs. David Willey is the new batsman, but it's Moeen Ali on strike. This is Pat Cummins's last over - and Michael Vaughan on TMS just wants Moeen to see the over out. Two dot balls. "That is genius. Taking any catch in front of the Western Terrace is incredible, but that is simply amazing." Don't go away! Plunkett lifts Maxwell high over mid-wicket in front of the Western Terrace, he catches the ball with both feet off the ground but, aware he is going to step over the rope, flicks the ball up with his right hand, catching it in his left as he re-enters the arena. There's some doubt over whether he needed to touch the ground inside the rope before taking the catch - but it's signalled out. It'll be on the internet soon, I'm sure - and you should check it out. A stunning effort. Plunkett singles to long-on, Moeen can't get the last ball away but it's a day to forget for Pattinson as he has 0-69 from eight overs. England need 18 from 30 balls to win, and Plunkett could do that in three shots. Plunkett stands and delivers, hoisting a huge six into the Football Stand. Long levers, that man, and it's advantage England. 19 from 32 needed. Now, you can't blame Australia for reviewing as there are only five-and-a-half overs left and they have their one review to use - but the main problem with this one might be whether it pitched outside leg stump... which it clearly did by a few inches. Not out. Plunkett has his home crowd on their feet as he smacks Pattinson for a four over extra cover, then slices a single to third man off the bottom edge. 26 from 34. "Everyone is feeling the pressure. Wade has been superb with the gloves all day, but when Cummins found the edge, he just dived a bit too far." Moeen steers a well-run two backward of point - then is dropped by keeper Matthew Wade as he gets an edge, Wade gets his left hand to it just off the ground but the ball doesn't stick. England need 31 from 36 balls to keep the series alive. Plunkett finally connects as he shovels a single to Pattinson who's patrolling down at fine leg. Will Cummins try the short ball to Moeen Ali? There's a slip in, but the Worcestershire man can only hit the ball straight to short extra cover. "You'd love to be England's position but that's not to say they can't make a mess of it." Australia keep going with Cummins - I think they have to - he has two overs left. Plunkett swishes and misses as the ball whizzes past his off stump, then can't connect with the next delivery. Willey's fans seethe. Greg: When you need less than a run a ball why reverse sweep? So many batsmen are out that way. David Willey's fan club (who were disappointed it took England until today to pick him) won't be pleased that the new batsman is Liam Plunkett. But he reaches outside off stump to hammer his first ball for four wide of long-on. Last ball of the over, he scrambles a leg bye. 34 to win from 42 balls. "Bairstow knows he would have got away with one if he had been given not out there. You could see on his face that he knew he got a little touch on it." The catch is clean, but what did it hit? Glove? HotSpot shows a fraction of a mark on the glove, there's a tiny squibble on the snickometer, then third umpire Joel Wilson goes back to HotSpot, then back to Snicko to "rock and roll" it, and after much deliberation, Mr Wilson's verdict is... out! Bairstow is at least the third man to get out reverse-sweeping today. Does this game have a last twist for us? "I think this is going to be given out. I think there is something on the glove." Moeen Ali slog-sweeps Maxwell into the air, he's caught by Joe Burns on the boundary but the opener can't keep his footing and falls over the boundary, so that's six! Bairstow steps back for the free hit ball but Cummins fires it outside off stump, Bairstow falls over and it flies off an edge for one - had he left it, it might have been signalled as a wide (giving him another free hit). Moeen rotates the strike, then Bairstow aims another big blast but is hit on the pad as he can't connect. 14 from the over - England need 46 from 48 balls. Theirs to lose from here? A Brucie bonus for England - Cummins bowls a chest-high full toss which Bairstow hooks for six over fine leg - so the hosts get six, plus a no-ball for height, plus a free hit. "England would get a lot of confidence from chasing this down. A lot of people around the ground have been commenting that a well-established, good side would do it." Bairstow smears another single, but Australia will be the happier side with just three from the over. 59 needed from 54 balls. Umpire Michael Gough makes the old "powerplay" signal to indicate that Australia can now put a fifth man outside the circle for the last 10 overs. Having made the breakthrough with that catch, man of the moment Glenn Maxwell is back into the attack to bowl his off-spin. Bairstow and Moeen exchange singles as the new man gets off the mark. Moeen Ali is the new batsman, and some of you have suggested he's batting a little low at number seven. But he's been an increasingly valuable batsman for England in all formats, and in replacing fellow southpaw Morgan he keeps the left-hand/right-hand combo. Cummins has 3-29 from seven overs, and England need 62 from 60 balls. "Some of the catches we've seen this summer has been insane. That ball was almost behind him and it's come at exactly the right time for Australia. Morgan's strokeplay this afternoon has been world-class. Maxwell is called The Big Show and now you've seen why." WHAT A CATCH! Glenn Maxwell redeems himself for that fumble earlier in the over, flinging himself to his right like a yellow-clad superhero and sticking out a paw to take a stunning catch and remove England's dangerman Morgan. The "Big Show" has really come to the party there - and Cummins has another wicket to start a new spell. Bairstow, who's scored plenty of runs on this ground in 2015, bisects extra cover and mid-off with a powerfully driven four. Aussie coach Darren Lehmann scratches his chin in the dressing-room, but it's not going his side's way as Morgan and Bairstow keep plugging away, reducing the England requirement to 64 from 66 balls. Ben Green: Morgan has been in fantastic touch this series, standout captaincy. Daniel Pheasant: Surely Morgan deserves the Test nod ahead of everyone. He's been superb! Marsh returns as Cap'n Smith shuffles his seamers - there are two fielders who are nearly close enough to hold hands in the backward point region, but Marsh starts with a legside wide and Morgan brings up the fifty partnership from only 29 balls. He's up to 90 as well. "I'm not sure Headingley is the Pattinson family's favourite cricket ground, notwithstanding Darren playing his only Test here." Pattinson has a slip in - Smith thinks "if I don't get Morgan out, I'm not going to win this game," according to Vic Marks on TMS - but Bairstow is joining in the fun, carving four more through the covers which means it's 13 off the over. Australia, needing a wicket, turn back to the pace of James Pattinson, but he serves up a couple of ropey half-volleys Morgan gets the crowd going again as he smashes a four through the covers and drilling a well-run three to long-on. Morgan clubs a single across the line - he has 79 from 82 balls while Bairstow, who's not had much of the strike despite having been in for a few overs, has 7 from 10 balls. And the Duke has a rather expensive 0-49 from six. Morgan rides his luck a little, aiming a delicate dab to third man - the ball flies off the edge but the result is the same: four runs. He then gets a bit of a "stare" from Hastings as he lines up another dab and plays inside the line. Next ball, he comes down the track and gets another thick edge, swiping a four over the vacant slip area. Not classical, but effective. "People get grumpy when players have rests, but if you are playing out there as a sportsman at international level and your mind has gone then you really are exposed." Morgan blasts another four down the ground to take England into the 200s, before a two takes his score to 70 and his ODI total for the calendar year to 790 - his previous best was 691 in 2010. And there's dissent in the technological ranks - the Duckworth-Lewis par score says England are slightly ahead, but the WASP only has them having a 47% chance of winning. It's still Mitchell Marsh from the Kirkstall Lane End, there's a loud appeal for lbw as Bairstow steps across to the off side (rather in the manner we've seen Steve Smith doing this summer) - but it's a curious appeal as Bairstow was a huge way outside off stump when contact was made, so he can't be out leg before if he's playing a shot (which he was). "In many ways this is the game we've be waiting for, with the match in the balance heading into the final stages." New balls, please - the ball is lodged in the gutter on top of the stand and so fourth umpire Richard Kettleborough comes out with a box of replacement balls. Australia were 187-4 at this stage - England need 104 from 15 overs. Australia send for the 'Duke' to restore a bit of law and order - John Wayne Hastings returns to the attack. He's already played an important role with the bat today, but is still searching for his first ODI wicket since April 2011 when they played Bangladesh immediately after that year's World Cup. But no-one's going to catch that one - Morgan lifts one over his head, off the middle of the bat and onto the roof of the Football Stand for six! Bairstow, with a high backlift, defends his first ball from Marsh, then plays a risky cut shot which squirms to third man for a single - Marsh raises his hands as though he thought the right-hander could have chopped that onto his stumps. But Morgan has the crowd cheering again as a more fluent cut brings him four more. The skipper has taken 72 balls to score 57 - with four fours and a six. Louis Leigh: A certain rum manufacturer should consider England's ODI Captain Morgan as a brand ambassador. He's clearly got the name for it. A big cheer from the Yorkies as their local hero Jonny Bairstow strides to the middle. A bit of a delay, I think they've taken the chance to take some drinks. "Gun-barrel straight, targeting that off stump and Stokes was just a bit late on it. Stokes will be so disappointed with himself, he was closing in on that fifty and a real opportunity to shout out loud why he should be in that position." Great delivery from Mitchell Marsh, as Stokes fails to lay a bat on a fast yorker which thuds into the base of his off stump. Stokes still only has two ODI fifties from 33 games. Maxwell over. Four singles. Steady. All you need to know. Even the WASP (Winning And Score Predictor) on the TV is hedging its bets - with England having a 49% chance of winning apparently - as Stokes helps himself to another four off his legs. Mark Taylor: The great Aussie teams used to play the same 11 in all formats of the game.They were just all good cricketers. Naveed Afzal: Finally a CLOSE game.... forgot what that felt like this summer. Come on England. Eoin Morgan reaches his fifty, stepping across to bunt the recalled Mitchell Marsh for a two down to third man. It has come from 66 balls - it's his 28th fifty on his 150th ODI appearance. (For the stattos out there, it's 23 fifties in 127 games for England, and five in 23 for Ireland before that). Michael Tiley: David Willey to score the winning runs, he has done it as a bowler but will show class with the bat today. Heard it here first! The Headingley crowd is getting a bit restless - it's the time of day where the construction of beer snakes appears to take priority over watching the actual cricket for some - as Maxwell wheels away for his sixth over. More steady accumulation, which the crowd may not appreciate, but it's setting the stage for a grandstand finish if this pair are still there in 40 overs. "England will believe they can chase these runs down. It's just about being sensible and not taking loads of risks. Will Steve Smith be thinking about someone like Pat Cummins to come back and break the partnership?" opened the batting with Sanath Jayasuriya for a World XI against Nepal in a charity game last month. England are still happy to plod along in singles, punctuated by the occasional four - Stokes steers one to the mid-wicket boundary. With 20 overs left... this one is difficult to call. Jack Beecroft: Hales is at the limbo standard between county cricket and international, maybe he just needs a tweak in technique or mind set. James Levy: Fragility of batting behind Morgan? Bairstow, Moeen, Willey, Rashid & Stokes hardly qualify as fragile. At least 200 runs there! MartinLeoHardy: In 18 ODIs Alex Hales averages 23.76. He averages 38.94 in first-class cricket. Incredibly large fan club for one so average. Glenn Maxwell, bowling his off-spin round the wicket to the two lefties, is easily milked for four singles by the England pair. It's nip and tuck as far as the two sides are concerned - they were both 143-3 after 25 overs, Australia were 165-3 after 29. "Eoin Morgan has been fantastic in this series and once again he has to lead from the front, certainly in this partnership." Crunching boundary from Morgan, who impresses any baseball fans who may be at Headingley today by flat-batting Stoinis back over his head for four. Stoinis responds with a bouncer which the England skipper helps down to fine leg for one. Stokes also clips one off his legs, keeping fine leg busy. This stand is worth 68. Michael Tiley: Could we not drop Bell who couldn't hit a beach ball at the moment and bring Taylor into the Test team? Fred Ridings: James Taylor gets one good score and he's suddenly being considered for a place in a completely different format? After that one-over burst from Pattinson, it's Maxwell back into the attack as Australia look to try to break this fourth-wicket stand. Careful placement from the two ginger left-handers pushes the England score to 150. They just need to double the score from here. Easy, huh? "If England keep going at five, possibly six an over, they'll get up to around 220 which leaves them 80 runs to get off the last 10 overs." Stoinis to continue - he's the latest in a line of one-day all-rounders the Aussies have tried in the last few years, such as the bear-like James Hopes. A tidy over, three singles from it, and Stokes has passed 20 for the first time in six games. Jeremy Leese: Moeen is a batsman who bowls, Stokes a bowler who bats, switch order, so Moeen not left with 2 over slog, can build an innings. Thanks, Sam. Even though it's Friday afternoon and thoughts turn to getting off for the weekend, I hope you'll stay with us and TMS as it could be another good finish. sign up for wicket alerts and/or take TMS with you via the BBC Sport app and BBC iPlayer Radio app. No excuses not to keep in touch! Ok folks, that's it from me. Mark Mitchener is steeled for the final throws of what's shaping up to be a cracker. Morgan pulls Pattinson. It's in the air, but doesn't quite carry to deep square leg. Big edge from Stokes heads exactly where a second slip would have been. You won't be surprised to hear there is no second slip, so it's four runs. A leg side wide from Pattinson does England no harm either, and neither does a Stokes hook round the corner which brings up the 50 partnership. The ball bounced into Wade's gloves. No wonder there was no appeal from the keeper himself! The Aussies look outraged by the decision. No idea why. Time for the debutant Stoinis to turn his arm over. He comes with an unimpressive List A average of 52.33. He's hits the mid-80s here and does a decent job of keeping England honest. Hold on - is this an edge from Stokes? Big appeal from Stoinis, but nothing from the wicketkeeper. The umpires are sending this upstairs. "England need to take some calculated risks, but not be reckless. Marcus Stoinis is now going to bowl for the first time in one-day international cricket. He's a batsman who bowls but he bowls a heavy ball, and he's built like a rugby player. He was originally from Western Australia and played there when I was captain - he lost his contract, moved to Victoria and he's done well there." That's more like it Morgs. An almighty heave at Maxwell sails high into the stands over midwicket, then an over-pitched delivery is driven for four. 13 runs from the over - England are back in gear. England are struggling here in the face of some tight Aussie bowling. Mitchell Marsh is bowling a long way wide of off stump and Morgan is refusing to take the bait. When he finally gets bat on ball, he picks out deep point and they run through for two. available as a TMS podcast. Not out: Morgan 18, Stokes 9. Wickets: 1-1 (Hales 0), 73-2 (Roy 36), 89-3 (Taylor 41). Bowling: Pattinson 5-0-30-0, Cummins 6-0-27-2, Hastings 4-0-28-0, M Marsh 4-0-19-1, Maxwell 2-0-5-0. Australia 299-7 (50 overs) -Maxwell 85, Willey 3-51, Moeen 2-40. This is good from Australia as Maxwell restricts England to a single. You can see why they are world champions because it is so difficult to get on top of them with bat and ball for any length of time. Morgan (16 off 31) looks a bit twitchy here with the ball not really coming on to the bat. He tries to get Marsh away and is fortunate to avoid picking out mid-off. Good over for the tourists - only two coming from it. "Six singles an over is fine at this stage - assess the conditions. Maxwell might be a guy to target, and Mitch Marsh can go for runs too." Spin at last, and England are ready to nudge away, collecting three singles and a leg side wide. Australia were 98-3 at this stage. Paul in Newcastle: On this form, could Taylor not open the batting? Worth a try, I feel. Joe from Barnet: In Roy have we found an opener in all forms of cricket? John in Swindon: If the quality of bowling across the wider county game was better, then it would be clearer which batsmen would be less likely to be found wanting at international level. Still no spin as Marsh runs in to Stokes, who caresses one out to deep midwicket for three. Morgan can't resist throwing the bat at a wide ball, and manages to clear the infield to pick up his first four of the innings. Could we be in for a close finish here? I'm not sure we've had one all summer between these teams. England's fast start has fizzled out - their worm is about to collide with Australia's. Matthew Wade is having quite a day. Fifty off 26 balls with the bat and now a catch for the ages. Cummins continues, trying to tempt Stokes with a short ball but very little doing as Australia continue to strangle England's scoring. England are three down as Stokes walks to the crease. Now then Benjamin, time for some runs methinks. He's off the mark with two through mid-on. "It's catches like that which win you games - England dropped a couple from Glenn Maxwell. There was talk of Hales going to the UAE as an opener, and he's not taken an opportunity in this series. But give Taylor an opportunity - it could be his moment with the changing of the coaches." "Sad end for Taylor as he was looking so good, but a wonder catch from Matthew Wade. Taylor is unorthodox, but you always wondered why he wasn't given a chance when he's been churning out runs and averaging more than 50 in both formats. There was talk he couldn't hit sixes - but I've seen him hit the ball out of this ground in T20." What a catch from keeper Wade! Taylor can't resist a dabble down the leg side, and even though he gets a fair bit of bat on it, Wade leaps like a salmon to take a one-handed catch. Taylor swings at a Cummins short ball outside off stump. Cummins appeals, but there's little support from his team-mates. Another tight over from the Aussie quick. How long before we see the spin of Maxwell? "Taylor's done enough for me to get on that plane to the UAE. I think they've got to take him. Jonny Bairstow's got that number five spot at the moment, which he would be fighting for - Taylor plays spin differently to many England players, using his feet well. He hasn't faced brilliant spin in this series, but he's played it in a good fashion, and he's looked good against the quick bowlers. He's read situations well, and that's what he'd have to do at five in Test cricket." Mitchell Marsh keeps the pressure on with three dot balls, then undermines his good work with a half-volley that Taylor slams down the ground. Two more to round off the over and take the in-form Taylor to 41 off 37 balls. Australia sense an opportunity here as the TV cameras once again pick out the man whose fancy dress outfit is a gorilla holding a man in a cage. Another good over from Cummins - just the one run from it. Richie Macca: How is *insert out of form player* in the team?! Why aren't they playing *insert county player* instead? They'd be much better. A rare misfield from George Bailey gifts Taylor a single, then Morgan wriggles one into the leg side for two. Hastings tries to tempt Morgan with width, but the England captain withdraws the bat at the last minute. He's in it for the long haul, and given the fragility of the batting below him, England need him to be. "Ashton Agar should be playing. It's strange the way he played a couple of Tests, then we've not seen him since - he plays one ODI then gets dropped. Mitchell Marsh plays one Test, then he's out, then he's back in. Be careful what you're doing to young players' minds." "Roy's had a good series, but this is the frustration when he gives an easy catch like that. A gift, really, and it's got Australia back in the contest." Roy falls tamely after a peach of a knock. He doesn't spot Cummins' slower ball and lobs a simple catch to Finch at mid-off. Roy has failed to go on once again, but by scoring so quickly he's taken the pressure off England's middle order. Four more to Roy, hammered over the bowler's head for four. Then a big appeal from Hastings for an inside edge through the the keeper. Taylor is unmoved and the review is not taken up. Taylor rounds off the powerplay by nearly taking Hastings' head off with a drive. Wow. Jon Read: Sick of this Hales bashing. People have been calling for him all summer! Give him a chance. Blue-eyed Bloke: What about that match winning hundred in the last World T20? Give Hales time. He'll come good. Jake Hyatt: Poor series for Hales, but has been formidable in T20. Been good in the championship too. Patience, something fickle fans lack. Roy of the Rovers? Looks that way as he middles a cut to the fence for his sixth four to go past Taylor's score. England are flying here. "That was coming at about 90mph, he's plonked it over mid-off and it's missed being a six by about six inches." Roy pulls out the KP flamingo as he clobbers Pattinson over his head for a one bounce four. The robust, bestubbled John Wayne Hastings resumes his fast medium offerings. Delicious drive from Roy - down the ground. Save your legs son. Rupert Grimshaw: Does Taylor deserve a look in for the Test side? Hales clearly isn't up to scratch and Lyth has had his chance. Fenners: Hales has 886 runs at 52 in Div 1, he's well worth a go in UAE. Bell has been given chances for 10 years so why shouldn't Hales? Better from the Aussies. England kept to singles by Pattinson but a healthy partnership developing here. Seb Horner: Moeen to open with Roy and Billings at 7 - let's not forget his last ODI was a crucial 40 odd with Bairstow in the win over NZ. Paul Nearn: How is Hales getting a game ahead of James Vince? Never done anything in an Eng shirt. Hastings is the new bowler, in his first ODI since 2011. Risky from Taylor - quick single and would have been gone if Cummins' throw had stuck timber. Roy slams another four through the offside then gets very lucky as an inside edge just misses leg stump and runs off for another boundary. Taylor only hit five fours in his entire century at Old Trafford. Now he's got six in his first 18 balls today. The Nottinghamshire man is loving life out there, lapping up a juicy leg stump half-volley and a wide one outside off to move to 25 not out and counting. Mark Lovick: Hales doesn't like Pace! Taylor is seeing it like the proverbial football, clumping Cummins through the covers for back-to-back fours. Then Roy gets in on the act, cashing in on some width with a lusty cover drive of his own. Good over to get England's score moving. JoElle: Forget Hales for UAE series. Stick with Lyth, let's see if he can come good. He has the talent, he needs the mentality now. Matthew Nunn: Glad this series has finally put to bed the calls for Hales to play Test cricket. Simply not good enough. So, is that really it for Alex Hales? Or will the selectors give him the fifth match and emblazon the words Last Chance Saloon on his England shirt? That's just two fifties in 18 ODI knocks for the Nottinghamshire man many are tipping to replace Adam Lyth in the Test side. Pattinson on the money once again. Roy can't get him off the square and shows his frustration with a wild waft at the final ball of the over. Michael Dearden: Why do the selectors keep Hales? He has proved to be totally out of his depth at this level and once again we are one down for nothing! Quick from Cummins - 91mph to welcome Old Trafford centurion James Taylor to the crease. Another full ball on leg stump is missed by Taylor. Big appeal. Umpire Dharmasena says no, and so does Steve Smith when Cummins asks his skip about a review. Taylor collects himself and clips the next ball through midwicket for four. "Pat Cummins doesn't normally take the new ball, but we saw in the first game that Alex Hales struggled to pick Cummins up. That was yorker length and was hitting leg stump. Again, he failed to pick it up." Ralph Brooker in France: Jason Gillespie is a CLASS act. Not criticising the ECB but in my opinion Bayliss must be absolutely red hot to have eclipsed the Yorkshire coach. Well done Yorkshire. Stop button located, we're under way with a very tidy first over from James Pattinson. A leg-side wide is his only blot on the scoreboard as Jason Roy has a good look. Afternoon all. Here we go then. Another first innings total around the 300 mark. Will the mythical concept of "scoreboard pressure" tell once again, or can the chasers finally have their day? And to talk you through the beginning of England's reply, here's Sam Sheringham. If you're one of the fancy dress hordes at Headingley, you should be getting ready to retake your seat - Australia are gathering by the boundary rope, ready to take the field. "75 years ago, with other games called off because of the war, the last match of the 1939 county season took place with Yorkshire playing Sussex at Hove. Yorkshire's Hedley Verity took seven wickets for nine runs - it proved to be his last game as he was killed in action." "The Last Match" - about that game. Will you rest any players from remaining games, with the title won? Yorkshire coach Jason Gillespie on TMS: "Possibly. We've spent a lot of time in the field - we'll look at it after the game, one thing we do well is to have good, honest conversations. We only have one day between games - we go to Southampton on Sunday to play on Monday." Yorkshire coach Jason Gillespie on TMS: "It was very pleasing to see him get a few wickets at his new home ground today." Josh Boyle: Pattern emerges: Bat first, make 300ish, win the match. Every side who bats first has won. Yorkshire coach Jason Gillespie on TMS: "Ever since we were told by the ECB last year that Andrew Gale [who was suspended for that game] couldn't lift that trophy, my blood has boiled. I can't tell you how satisfying it's going to be when he rightfully gets to lift that trophy at the end of this game." Neal McGrath: Why do bowlers try and vary things so much in the last few overs? Wide yorkers. You'll struggle to hit them for six! Yorkshire coach Jason Gillespie on TMS: "We've lost players to injury, suspension and England call-ups this season, so we've used 21 players. But people have stepped up - we spoke last year after we won the title at Trent Bridge how we'd like to repeat it, and they've backed up those words." How did you find out you'd won the title? Yorkshire coach Jason Gillespie on TMS: "There were some members just below our balcony telling us how Notts had just lost their last wicket, but I was so focused on our game, it didn't really sink in." From the House of Commons to Lord's - TMS are now crossing to the home of cricket where Alison Mitchell has been joined by Yorkshire's County Championship-winning coach Jason Gillespie. Will you allow Geoffrey Boycott to coach your son, as he's offered? Prime Minister David Cameron on TMS: "He's made this very kind offer. But the last time Geoffrey said anything about my batting, it was when I'd faced an over from Muttiah Muralitharan in Sri Lanka. I did manage to hit one or two, but Geoffrey virtually ripped my arm off showing me my elbow wasn't right. I played in a village match a few years ago and got 57 not out, which was my highest score. But even as a spin bowler, I had to ask Muralitharan to slow it down..."
Rakesh Pradhan: Thought my £1 on England at evens was a great bet, not sure now. Should cricket return to terrestrial television? Prime Minister David Cameron on TMS: "We have to make sure the sports bodies are thinking through their decisions. You need the specialist broadcasters to cover matches in full, but the great strength of terrestrial television is that it's a window [for the game]. Selfishly, as a parent and a fan, you want a bit of both. I have Sky at home as I like to watch the cricket." Prime Minister David Cameron on TMS: "Obesity is one of the biggest issues facing our health service. Encouraging sport is part of that - our responsibility is making sure there's sport available in schools." Prime Minister David Cameron on TMS: "The Ashes squad will be coming to Downing Street for a non-Flintoff-style celebration." Prime Minister David Cameron on TMS: "Every day, I think what an enormous privilege it is to do this job. But your future is in the hands of the people. So many countries in the world would love to be able to throw their government out - [democracy] is a very precious thing we've got." Steve in Wigan: Re: ugliest monstrosity [42nd over]. Surely it has to be the building at Lord's? So reminds me of the alien heads from the famous mash potato advert in the 80s. picked up saying something this morning which wasn't meant to be heard - there were five or six proposals for devolution in Yorkshire, and I said to an aide that I thought Yorkshiremen had it in for other people rather than each other, clearly as a joke. But I've been absolved by two of the greatest living Yorkshiremen - Geoffrey and Dickie Bird both agreed it was a joke." England bowler David Willey, speaking to Sky Sports: "It was nice to get us off to a good start. I always try and swing the white new ball. Unfortunately I missed my line and length at the end and went for a few too many. I think the pitch might be getting better though. It did a bit this morning but fingers crossed it's flattened out a little bit." Prime Minister David Cameron on TMS: "Geoffrey Boycott has been after me for about three years to come to Headingley, so it's great to be here and watch a bit of cricket. I've had a good summer holiday with my family, but you're always on duty." A round six an over needed by England, then, to keep the series alive for the final ODI which is back at Old Trafford on Sunday. And while we moan about over-rates a lot - England have actually bowled theirs early, thanks to all that spin.